The VMC Spinshot hook is the new generation of drop shot rigging. 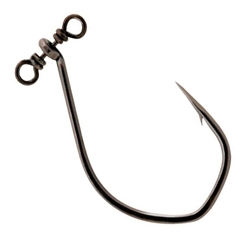 This hook eliminates all line twist, improving presentation and hooking performance. The Spinshot hook makes drop shotting easier to rig which gives you more time fishing! It also provdes a more natural Drop Shot presentation than competitors.